The decade she spent as a mental health counselor taught Laura Waller how to decipher and understand clients’ thoughts and behaviors. That ability adapted perfectly when she switched from social work to financial planning, founding Waller & Wax Advisors. Now she applies her analytic insights to her third career, a full-time artist concentrating on urban landscapes. Waller’s work has been featured in four exhibitions in Florida and Maine in the past two years. Tampa’s Clayton Gallery hung Working Waterfront: Port Tampa Bay in 2015 followed by her Port Side series in 2017. Elizabeth Moss Galleries of Falmouth, Maine, showed Working Waterfront: New Work in summer 2016 and plans a second show next year. Last month she exhibited solo at the ArtCenter Manatee in downtown Bradenton. Waller closed her private counseling practice in St. Petersburg and began training to be a securities broker with Raymond James Financial in 1978. “I called Tom James (chairman emeritus) and asked if he wanted a social worker on his staff and he responded, ‘Do you want to sell?’ ” James saw the many parallels between the two professions when it comes to building relationships and trust. 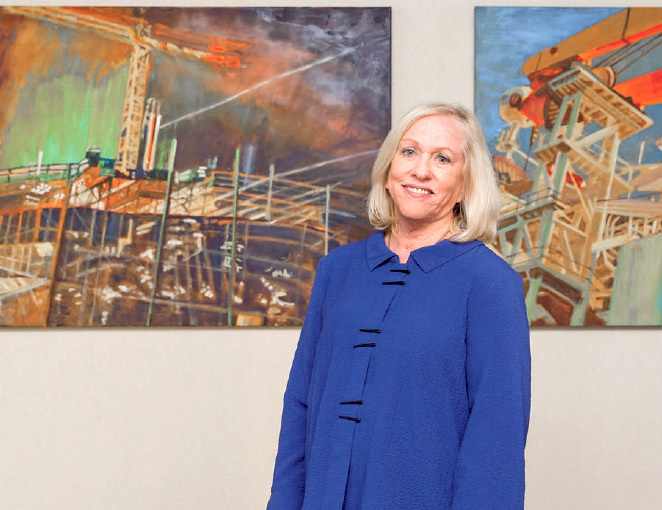 Diving into the financial world was all-consuming, she said, “like learning a foreign language.” Over the next 34 years, Waller earned local and national recognition including a Money magazine ranking of the nation’s Best Financial Planners in 1987. All the while, Waller found respite in her art. “I started with scenes along the waterfront, fishing villages and lobster boats in Maine where we have a second home,” she said. A cancer diagnosis in 2005 precipitated her move away from wealth management, with encouragement from husband Ed Waller, now retired after 50 years of law practice. The solution was born many years earlier, son Jon Wax, 48, a Raymond James broker, would merge his practice with Waller’s group in 2006. Acclimating to solitary hours in her home studios in South Tampa and Rockland, Maine, took some time, she said, happy to have her miniature Australian labradoodle Teddi for company. “I also embraced social media as a way to stay in touch and be seen in this new role,” said Waller, 72. When she mentioned looking for subject matter to develop as her own, a friend suggested she visit Port Tampa Bay. Waller was immediately intrigued. Waller is pleased with sales; her work is collected by individuals and corporations nationwide. “Life is a journey,” she said. “You need goals to know what you’re heading toward.